In his first interview following a summit and press conference with Russian President Vladimir Putin on Monday, President Donald Trump told Sean Hannity of Fox News he thought Putin was "very, very strong" and complained that the "phony witch hunt" into Russia's interference in the 2016 election has driven a "phony wedge" between the two nations. "Ninety percent of the nuclear power in the world between these two nations, and we've had a phony witch hunt deal drive us apart," Trump said, going on to say he thinks the probe is the biggest impediment to stronger relations. "It's the thing that he told me when he went in. He said, 'What a shame.'" The president reiterated that Putin strongly denied collusion and also brushed off the idea Russia had compromising information on Trump. "He said there was no collusion whatsoever. He said it as strong as you can say it. They have no information on Trump," Trump said. "And one thing you know, if they had it, it would have been out." 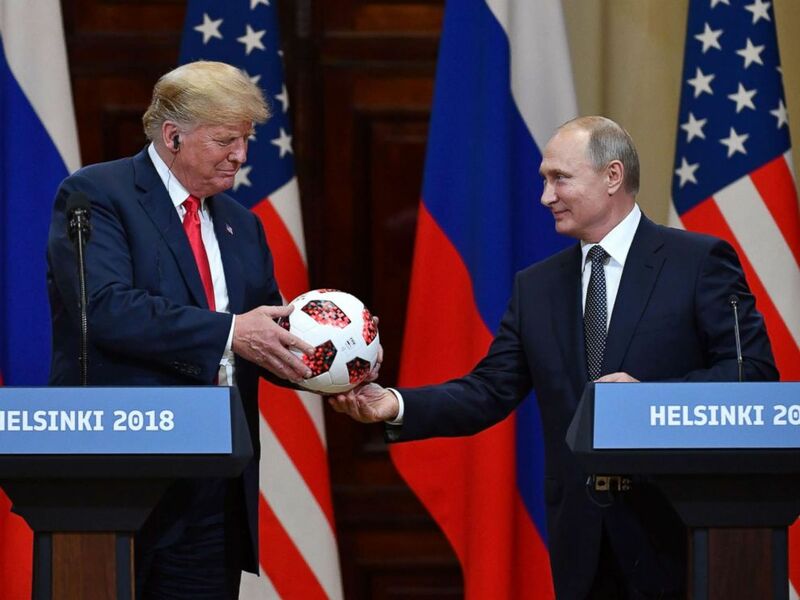 Russia's President Vladimir Putin offers a ball of the 2018 football World Cup to President Donald Trump during a joint press conference after a meeting at the Presidential Palace in Helsinki, Finland, July 16, 2018. The president said that although he believes U.S.-Russian relations were at a historic low point just prior to his meeting with Putin, he is now hopeful for cooperative relations going forward. "It was great today, but I think it was really bad five hours ago," Trump said. "I think we really had a potential problem. Dealing with two nuclear nations. At 90 percent of the nuclear power in the world between these two nations, and we've had a phony witch hunt deal it drive us apart." In addition to his comments at the press conference, Putin again denied any Russian interference in the U.S. election in an interview with Fox News’ Chris Wallace. "Interference with the domestic affairs of the United States -- do you really believe that someone acting from the Russian territory could have influenced the United States and influenced the choice of millions of Americans?" Putin said. "This is utterly ridiculous." Putin also denied to Wallace that his government has "compromising material" on Trump. 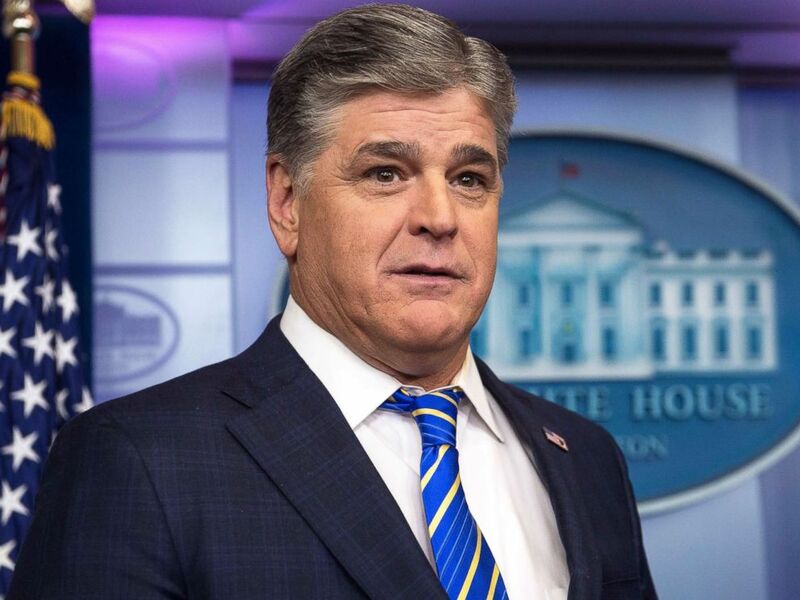 Fox News host Sean Hannity is seen in the White House briefing room in Washington, D.C., on Jan. 24, 2017. He interviewed Donald Trump after the president's summit meeting with Vladimir Putin. "We don't have anything on them," Putin said. "I don't want to insult President Trump when I say this -- and I may come as rude -- but before he announced that he will run for presidency, he was of no interest for us." In an interview with Russian TV outlet Channel 1, Putin offered compliments of Trump following their summit, saying he was an "interesting conversation partner." "He is a very qualified person, he knows the material, he listens, he takes in arguments, he keeps his own opinion on some questions," Putin said. ABC News' Patrick Reevell contributed to this report.